Martha Berry writes to Mrs. Barnes to confirm the date of her engagement to speak at the D.A.R meeting. If she is not well enough, Inez Wooten will go in her place. 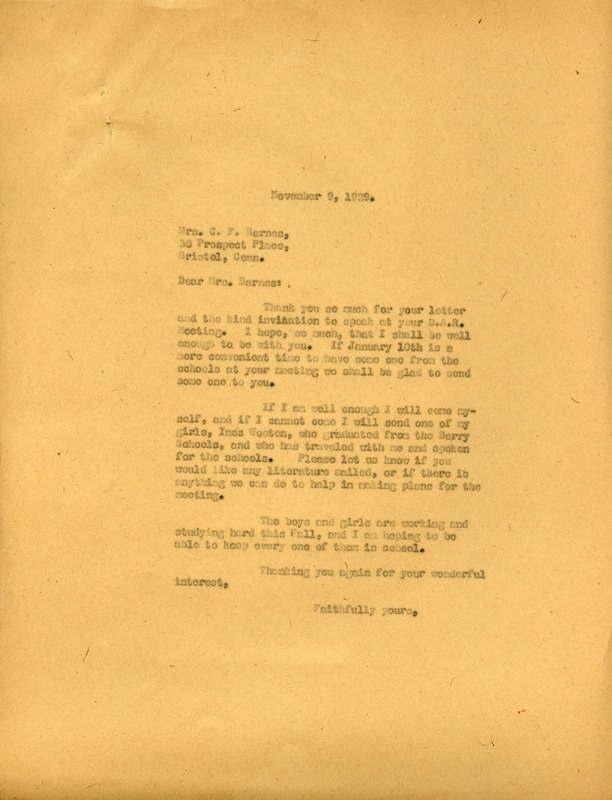 Martha Berry, “Letter to Lena F. Barnes from Martha Berry.” Martha Berry Digital Archive. Eds. Schlitz, Stephanie A., Sherre Harrington, Meg Ratliff, Aaron Jackson, et al. Mount Berry: Berry College, 2012. accessed April 21, 2019, https://mbda.berry.edu/items/show/9484.